You know the old adage about the early bird catching the worm? Or how about the one about riding a bike? Well, in Saskatoon you need to combine the two: be an early bird and ride a bike so you don’t forget to get… worms? Whichever, but we’ll wager that one of the best ways to experience Saskatoon is by bike. Cycling through the streets downtown, riverside trails or quiet side streets is a great way to blend in and feel at home here. Seeing Saskatoon at your own pace means you can stop for snacks at neighbourhood bistros, fill your phone with selfies by every single bridge if you are so inclined, and in the evenings, folks around here will tell you all about how they think mosquito season is shaping up. It’s important to know these things. The Saskatoon bike experience isn’t limited to summer months, though. Just because we get piles of snow and oh-my-goodness cold, locals prove their love for biking year-round. 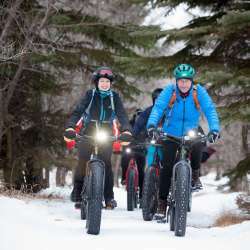 The fat bike (not an insult, just a literal description of its tires) means getting from here to there across sheets of ice or drifts of snow is no problem. Make sure you’re toasty warm by visiting one of the local outfitters for prairie-approved gear. To reward yourself, order a shot of piping hot caffeine and a baked treat from Drift or The Karma Café. DTNYXE (our downtown business improvement organization) has partnered with several Saskatoon hotels to offer guests free bicycles for your leisurely use. Ask the front desk or concierge what the best bike routes are and soon you’ll be on your own biking adventure! A few shops in town will happily rent you a road bike. For a relaxing day tour, head to Riversdale where a casual ride by the Saskatoon Farmers’ Market may just land you a basket full of local veggies and handmade goods. A great resource to help you get started is the City of Saskatoon&apos;s cycling guide. 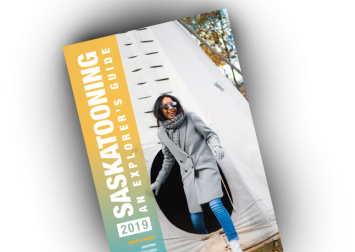 The Cycling Guide rates every road in Saskatoon, from novice to intermediate and expert, and provides suggested routes and facilities that have been identified by experienced local cyclists and City staff. You can get your free copy of the guide at Civic Leisure Centres, all branches of the Saskatoon Public Library and local bicycle retailers. Check out the image gallery below of real people really biking in all seasons and you&apos;ll see how much fun it can be! Now you’re well on your way to becoming a winter-loving Saskatonian! Summer or Winter, it's fun for everyone!